Paleolitik dönemin erken evresinde köken alan “sosyal zihin”in yapısı, bir insan toplumun içeresindeki bir bireyin hayatı ve düşünceler üzerinde en güçlü etkiyi işaret etmektedir. Toplumdaki diğer sosyal kurallar ve ritüeller ile birlikte, zamanla çevresel ve sosyo-teknolojik değişimlerinin sonucunda biçimlendirilen doğaüstü varlıklar hakkındaki inançlar da, sosyal zihin’in ürünleri olarak düşünülür. Güneydoğu Türkiye, tarih öncesi dönemden beri farklı insan gruplardan çeşitli doğaüstü güçlere inanıldığı ve bu inançlara ait arkeolojik kalıntılarda yaygın olarak bulunduğu bir bölgedir. Günümüzde de, doğaüstü varlıklar üzerinde inançların yanı sıra sosyo-psikolojik etkileri, Türkiye’nin diğer bölgelerine karşılaştırarak bu bölgede daha fazla görünmektedir. Bu nedenle, etnografik alan çalışmalardan elde edilen 53 vakanın arasında en dikkat çeken 4 vakanın incelendiği bu araştırma, doğaüstü inanç üretiminde sosyal zihin’in güç ve fonksiyonlarını göstermeye çalışmıştır. Bu araştırma ayrıca, doğaüstü inançların sonucu olarak bölgedeki farklı nesillerin üzerindeki devam eden sorunları da incelenmiştir. Originated in early phase of Palaeolithic period, the structure of social mind marks the strongest effect on an individual from a distinct human group. The beliefs on supernatural beings, along with other norms, rites and rituals, are actually considered to be the products of the social mind that has been formed and reformed following environmental and socio-technological changes of humanity through time. Southeast Turkey is a region where all people groups have been believed on different types of supernatural forces and this is commonly found in archaeological remains since prehistoric period. Moreover, at present day, the beliefs on supernatural beings as well as their socio-psychological effects are more visible in the region comparing to other parts of Turkey. Therefore, out of 53 case studies obtained in ethnographic fieldworks, thorough examination of 4 individual case studies have been performed in this study to illustrate the power and functions of social mind in producing the beliefs on supernatural beings. Further, as the consequence of these beliefs, the generation sufferings in the region have also been examined in this study. Al-Habeeb, T.A. (2003). A pilot study of faith healers’ views on evil eye, jinn possession, and magic in the kingdom of Saudi Arabia. Journal of Family and Community Medicine, 10(3), 31-38. Alosaimi, F.D., Alshehri, Y., Alfraih, I., Alghamdi, A., Aldahash, S., Alkhuzayem, H., Albeeeshi, H. (2014). Prevalence of psychiatric disorders among visitors to faith healers in Saudi Arabia. Pakistan Journal of Medical Sciences, 30(5), 1077-1082. Doi: 10.12669/pjms.305.5434. Ashouri, A., Mohammadzadeh, A., Najafi, M., & Zeraatkar, L. (2016). Relationship between personality traits and religious/spiritual well-being with schizotypal traits. Iranian Journal of Psychiatry and Clinical Psychology, 22(3), 230-239. Doi: 10.18869/acadpub.ijpcp.22.3.230. Barrett, J.L. & Lanman, J.A. (2008). The science of religious beliefs. Religion, 38(2), 109-124. Doi: 10.1016/j.religion.2008.01.007. Boden, M.T., Berenbaum, H., & Topper, M. (2012). Intuition, affect, and peculiar beliefs. Personality and Individual Differences, 52(7), 845-848. Doi: 10.1016/j.paid.2012.01.016. Braswell, G.S., Rosengren, K.S., & Berenbaum, H. (2011). Gravity, God, and ghosts? Parents’ beliefs in science, religion, and the paranormal and the encouragement of beliefs in their children. International Journal of Behavioral Development, 36(2), 99-106. Doi: 10.1177/0165025411424088. Farias, M., Claridge, G., & Lalljee, M. (2005). Personality and cognitive predictors of New Age practices and beliefs. Personality and Individual Differences, 39, 979-989. Doi: 10.1016/j.paid.2005.04.003. Games, A. (2010). Witchcraft in Early North America. New York: Rowman & Littlefield Publishers. Gervais, W.M., Willard, A.K., Norenzayan, A., & Henrich, J. (2011). The cultural transmission of faith: Why innate intuitions are necessary, but insufficient, to explain religious belief. Religion, 43(3), 389-410. Doi: 10.1080/0048721X.2011.604510. Kapogiannis, D., Barbey, A.K., Su, M., Zamboni, G., Krueger, F., & Grafman, J. (2009). Cognitive and neural foundations of religious belief, 106(12), 4876-4881. Doi: 10.1073/pnas.0811717106. Kosek, R.B. (1999). Adaptation of the Big Five as a hermeneutic instrument for religious constructs. Personality and Individual Differences, 27(2), 229-237. Doi: 10.1016/S0191-8869(98)00235-9. Lawson, J., Baron-Cohen, S., & Wheelwright, S. (2004). Empathizing and systemizing in adults with and without Asperger Syndrome. Journal of Autism and Developmental Disorders, 34, 301-310. Lindeman, M. & Aarnio, K. (2007). Superstitious, magical, and paranormal beliefs: An integrative model. Journal of Research in Personality, 41, 731-744. Doi: 10.1016/j.jrp.2006.06.009. MacDonald, D.A. (2000). Spirituality: Description, measurement, and relation to the five factor model of personality. Journal of Personality, 68(1), 153-197. Doi: 10.1111/1467-6494.t01-1-00094. McCullough, M.E., Tsang, J.A., & Brion, S. (2003). Personality traits in adolescence as predictors of religiousness in early adulthood: Findings from the Terman Longitudinal Study. Personality and Social Psychology Bulletin, 29(8), 980-991. Doi: 10.1177/0146167203253210. Mehra, M. & Agrawal, A. (2016). ‘Witch-hunting’ in India? Do we need special laws?. Economic & Political Weekly, LI (13), 51-57. Middleton, J. & Winter, E. H. (2004). “Introduction”. In: Middleton & Winter (eds.) Witchcraft and Sorcery in East Africa. London: Routledge. Pp. 1-26. Norenzayan, A., Gervais, W.M., & Trzesniewski, K.H. (2012). Mentalizing deficits constrain belief in a personal God. PLoS ONE, 7(5), 1-8. Doi: 10.1371/journal.pone.0036880. Premack, D. & Woodruff, G. (1978). Does the chimpanzee have a theory of mind?. The Behavioral and Brain Sciences, 4, 515-526. Riekki, T., Lindeman, M., & Raij, T.T. (2014). Supernatural believers attribute more intentions to random movement than skeptics: An fMRI study. Social Neuroscience, 9(4), 400-411. Doi: 10.1080/17470919.2014.906366. Riekki, T., Lindeman, M., Aleneff, M., Halme, A., & Nuortimo, A. (2013). Paranormal and religious believers are more prone to illusory face perception than skeptics and nonbelievers. Applied Cognitive Psychology, 27(2), 150-155. Doi: 10.1002/acp.2874. Routledge, C. Abeyta, A.A. & Roylance, C. (2016). An existential function of evil: The effects of religiosity and compromised meaning on belief in magical evil forces. Motivation and Emotion, 40, 681-688. Saroglou, V. & Munoz-Garcia, A. (2008). Individual differences in religion and spirituality: An issue of personality traits and/or values. Journal for the Scientific Study of Religion, 47(1), 83-101. Doi: 10.1111/j.1468-5906.2008.00393.x. Schjoedt, U., Stodkilde-Jorgensen, H., Geertz, A.W., & Roepstorff., A. (2009). Highly religious participants recruit areas of social cognition in personal prayer. Social Cognitive and Affective Neuroscience, 4, 199-207. Doi: 10.1093/scan/nsn050. Siddiq, A.B. (2017). Pastoral societies of mardin province in southeast anatolia –some anthrozoological aspects. Mukaddime, 8(2), 57-69. Doi: 10.19059/mukaddime.296314. ––– (2018). Socio-psychological effects of the beliefs on supernatural beings: Case studies from Southeast Anatolia. Artuklu Human and Social Science Journal, 3(1), 10-19. Şanlı, S. & Siddiq, A.B. (2018). Anthrozoological study on the agro-pastoral societies of Kızıltepe, Southeast Anatolia. İnsan & İnsan, 5(16), 121-138. Doi: 10.29224/insanveinsan.378568. Taylor, A. & MacDonald, D.A. (1999). Religion and the five factor model of personality: An exploratory investigation using a Canadian university sample. Personality and Individual Differences, 27, 1243-1259. Doi: 10.1016/S0191-8869(99)00068-9.
van Elk, M., Rutjens, B.T., van der Pligt, J., & van Harreveld, F. (2016). Priming of supernatural agent concepts and agency detection. Religion, Brain, & Behavior, 6(1), 4-33. Doi: 10.1080/2153599X.2014.933444. Willard, A.K. & Norenzayan, A. (2013). Cognitive biases explain religious belief, paranormal belief, and belief in life’s purpose. Cognition, 129, 379-391. Doi: 10.1016/j.cognition.2013.07.016. Yin, R.K. (2014). Case Study Research: Design and Methods. London: SAGE Publications Ltd.
ISNAD Siddiq, Abu Bakar , Oğuz, Güler , Güldoğan, Emre . "Supernatural or “social mind”? 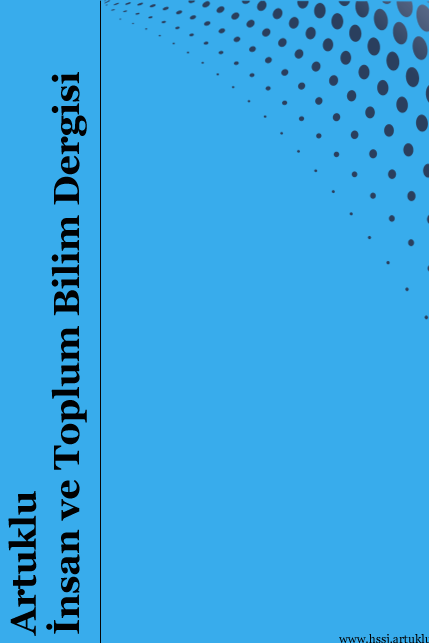 –Four case studies from Southeast Turkey". Artuklu İnsan ve Toplum Bilim Dergisi 3 / 2 (December 2018): 60-69.